The first session of Omaha High School, now Central High School, was held on November 10, 1859, in Nebraska's territorial capitol on Ninth Street between Douglas and Farnam. Following the removal of the territorial government from Omaha, Nebraska's last territorial capitol at Twentieth and Dodge Streets was donated to the city by the state in 1869 for educational use. The old building, declared unsafe, was razed in 1870 and replaced by a red-brick, four-story structure in 1872. The first class of Omaha's first public high school was graduated in 1876. The new building, housing both the high school and Central grade school, soon was unable to accommodate its growing enrollment, and by 1900 the cornerstone of another building had been laid. Construction encircled the old school, which was dismantled and removed before the final north wing was completed in 1912. A new gymnasium and auditorium were added in 1930. From this vantage point on the old Capitol Square, Central High School has witnessed many changes in the community, the nation, and the world. Now in its second century, it remains dedicated to high scholarship and the principle that all children deserve equal educational opportunities. 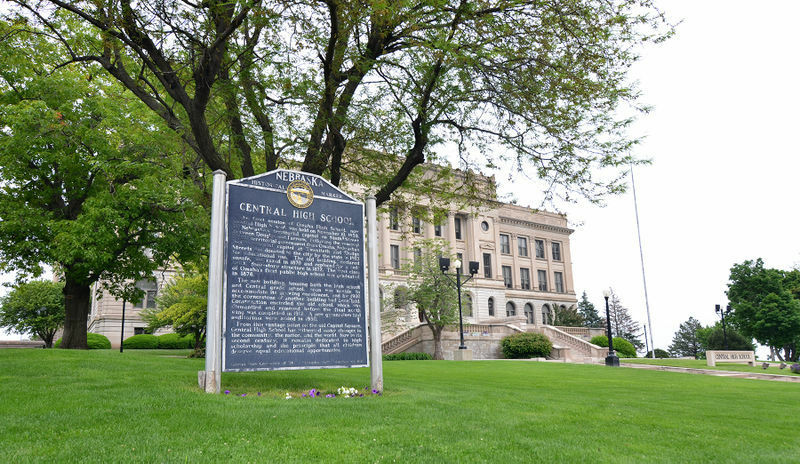 “Central High School,” Explore Nebraska History, accessed April 18, 2019, https://mynehistory.com/items/show/180.